Not much to say. There seems to be a lot of Skillbillies out there nowadays. 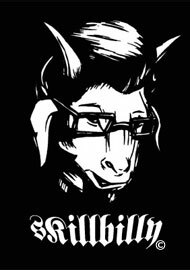 Skillbilly was a nickname given to me years ago before I even had a website. When you did a search in Google you would actually get no results. Now you get pages and pages. The site used to be used for my freelance web design and photography work which i still do once in a while. I’ve scaled everything back and have one or two old clients that I still do work for. The site was down for a bit as I got tired of the old layout and had no time to update it. Now it still serves to show some of my work, but it’s turning more into a blog about all my varied interests. Hot rods, photography and web design are just a few. If you got this far you probably know me , if not thanks for playin.